We are manufacturer of Wine Boxes In India with production line of 5000 pieces per day. We have automatic plant for production of Wine Boxes. We supply Wine boxes both in Cardbaord or MDF/Wood. 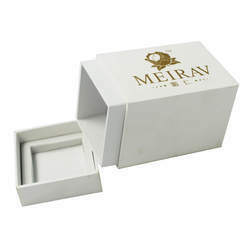 We are offering paper wine boxes and paper boxes which are lightweight, trendy, collapsible yet classy. These boxes offer great strength and can handle the wine bottle easily. Offered at industry leading prices, these boxes are easy, comfortable in carrying the wine. 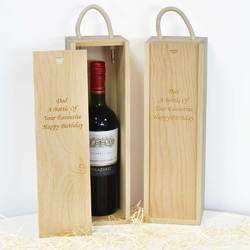 Size (Dimension): 13" x 4" x 4.5"
This is a colonial style wood case, just perfect for presenting bottle of wine this new year and any time for greetings. This comes with an elegant pouch of chocolates complimentary with each case and the wine bottle can be arranged on request. Our special product is in demand……….. wide range of wine accessories available on clients demand. Essential wine accessories & bar tools for opening, serving & preserving your wine & spirits. We offer a great selection of wine accessories. A unique gift to give it to your business partners, colleagues, clients.